An aphorism is nothing else but the slightest form of writing raised to the highest level of expressive communication. An aphorism is usually a saying expressing a belief, an idea, a thought, a saying, a piece of literature and so on. Synonyms for aphorisms could be: adage, apothegm, axiom, dictum, maxim, moral, precept, proverb, rule, saw, saying, truism, axiom, device, dictum, fundamental, law, maxim, moral, postulate, precept, proposition, proverb, saying, theorem, truism, truth, byword, catchphrase, catchword, dictum, epithet, gnome, gnomic saying, handle, maxim, motto, nickname, precept, proverb, quotation, quote, saw, shibboleth, slogan, standing joke. An aphorism can express also absurdity, ambiguity, foolishness, nonsense and paradox. An aphorism is therefore a concise expression of doctrine or principle or any generally accepted literary sentence or conveyed in a pithy, memorable statement. Aphorisms have been especially used in dealing with subjects that were late in developing their own principles or methodology, for example, art, agriculture, medicine, phisics, jurisprudence, literature, economics and politics. We might add to conclude this paragraph that an aphorism is nearer to a definition or a proverb, that’s also short and to the point. Usually, it’s supposed to impart some important moral lesson. A maxim on the contrary is a slogan or a personal prescription for some generality of life; importantly, it does not have the same moral connotations as an aphorism, but in many ways they are more or less the same, or to be more precise they are synonyms with obviously some slight differences. The term was first used in the Aphorisms of Hippocrates, a long series of propositions concerning the symptoms and diagnosis of disease and the art of healing and medicine, where disease was coming to be regarded as a natural rather than a supernatural phenomenon and doctors were encouraged to look for physical causes of illness. Some of the works, notably the Aphorismi (Aphorisms), were used as textbooks until the 19th century. The first aphorism, which serves as a kind of introduction to the book, runs as follows: Life is short, Art long, Occasion sudden and dangerous, Experience deceitful, and Judgment difficult. Neither is it sufficient that the physician be ready to act what is necessary to be done by him, but the sick, and the attendants and all outward necessaries must be lightly prepared and fitted for the business. A well-known medieval collection of aphorisms is that formulated in about 1066 in Latin verse by the celebrated doctor Joannes de Meditano, giving the precepts of the medical school of Salerno. Another collection of aphorisms, also medical and also in Latin, is that of the Dutchman Hermann Boerhaave, published at Leiden in the year 1709; it gives a terse summary of the medical knowledge prevailing at the time and is of great interest to the student of the history of medicine. 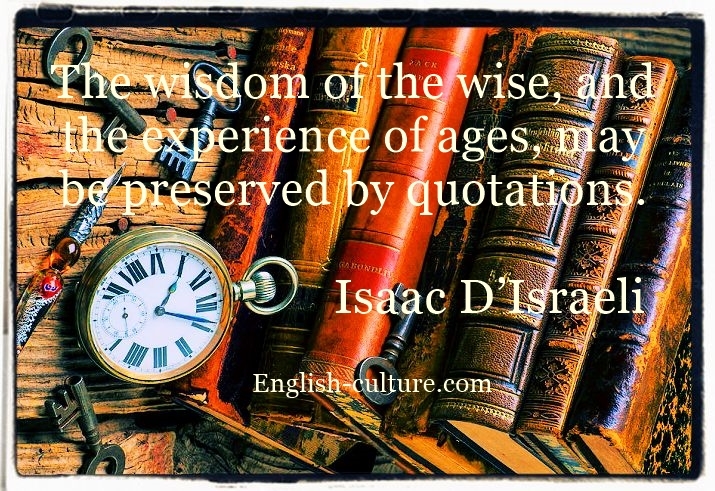 There are practically lots of quotes on any argument, but the most famous of them are certainly: inspirational quotes, motivational quotes, philosophical quotes, scientific quotes, law quotes, humor quotes and then quotes about love, about life, on success, marriage, etc… and then what about proverbs, sayings and the old famous wisdom literature. Proverbs like aphorism are short saying that states sometimes a general truth or more often something else, they use all the different rhetoric figures and can give us a lot of definitions, methaphors, moral teachings, observations, and can help us create and develop more thoughts or pensée. They can act as an inspiration and serve as a practical guide to living a better and more conscious life. As a matter of fact, a proverb is a horse which can carry one swiftly to the discovery of the ideas, says a Yoruba old maxim. Because proverbs and quotes have such a profound impact on our lives, there are many things written about them: how they can influence us, how we can use them, remember them, learn from them and so on, but the real things is that usually they create a positive impact on our attitude and therefore they are really great motivators. A lot of people, old and young, from all over the world enjoy reading quotes, that’s why there are plenty of websites, social networks pages or smartphones application and books that contain quotes and aphorisms. To be really good aphorisms, we have to say that they must be short, or brief if you prefer, they must be definitive and personal, they must hace a twist or a surprise, and above all they must be philosophical, mind provoking and stimulating, so that they can help you thinking about different topics, subjects or a particular argument. You do not have to read a whole book to get to the point. A short sentence can sometimes trigger a whole range of processes such as thinking, observing, meditating and reflecting. These are certainly powerful catalysts for everyone’s life. On the other side, a quote presents the actual words of someone else. Aphorisms are wise or clever sayings that may or may not be quotations. Anyway there is a small difference between the two short form of literary expression. As a matter of fact, just like proverbs, quotes are not only words. They carry much more than just meaning – they carry human experiences as the Spanish author Miguel de Servantes wrote: “Proverbs are short sentences drawn from long experiences.” Since they enable us to reflect upon experiences of other people, quotes and sayings can serve as a powerful learning tool. What’s more they can motivate you, sometimes the right quote can give you the intellectual strength to take the proper decision, or to act and to change your life in a good way. Finally they can have the power to replace destructive and negative thoughts with positive ones. Also famous people have their mottos and great companies have their slogans, too. In fact a certain way and method of thinking can help you to reach a certain success in life. A right quote can explain your life philosophy, fundamental beliefs and directions, and all of this just through one simple sentence. First of all, such single statements are easy to remember. Secondly, it takes only a few seconds of your time to energize and remind yourself of your vision and purpose because as David Brinley says – A successful man is one who can lay a firm foundation with the bricks others have thrown at him. However success is never an easy thing to achieve and to be successful, you need to have a vision, a target, a goal, and quotes can help you to follow a good path, while giving at the same time some useful and good advices. Many successful people chose to do things that were considered impossible in their time and age. When these men set out to achieve the impossible, they had to face not only the challenges posed by the monumental task itself, but in some occasions also face the ridiculous and contempt of people around them, that’s why quotes along this process can certainly give some courage, support and comfort to carry on. However, in spite of the derisive attitudes of their friends, family and foes; in spite of people pointing out to them what a lost cause it was, they kept going, on the strength of their conviction and the passion that told them that it was possible. And, in the end, they made it possible too! James Allen used to say, “For true success ask yourself these four questions: Why? Why not? Why not me? Why not now?” and so to conclude this short article we can say that quotes, proverbs and aphorisms can really help us to create and correct our ways through life in order to contribute to making something extraordinary possible to happen.